More than five million new cases of cancer are diagnosed every year in OECD countries. Mortality rates are declining, but not as fast as for other big killers such as heart disease, and cancer survival rates show almost a four-fold difference across countries. In short, many countries are not doing as well as they could in the fight against cancer.Cancer Care: Assuring Quality to Improve Survival surveys the policy trends in cancer care over recent years and looks at survival rates to identify the why some countries are doing better than others. It sets out what governments should do to reduce the burden of cancer in their countries. As well as an adequate level of resourcing, a comprehensive national cancer control plan appears critical, emphasising initiatives such as early detection and fast-track treatment pathways. Countries also need better data, particularly for patients’ experiences of care, in order to provide high quality, continuously improving cancer care. >> Breast Cancer Awareness Month, October 2017: Read the article "How should the EU act differently in tackling the burden of breast cancer? ", by Francesca Colombo and Rie Fujisawa, Government Gazette, July 2017 issue. Cancer is one of the major public health issues in OECD countries. It is the second cause of death (after cardiovascular disease), accounting for more than a quarter of all deaths in many OECD countries, while at least one-third of cancer can be prevented and a further third can be either detected early or effectively treated. 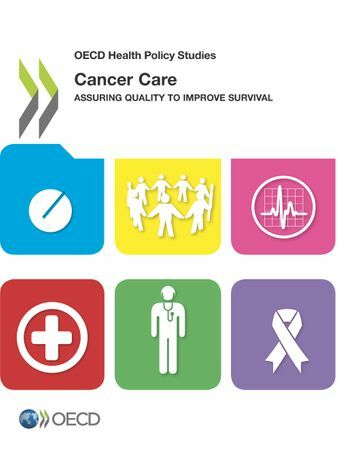 The OECD collects the following indicators on cancer care: Cancer survival estimates (breast, cervical and colorectal cancers), Cancer mortality rates (all and by type of cancer), and Screening rates (breast and cervical cancers). Health at a Glance 2017: OECD Indicators includes cross-national data, descriptive analysis and methodological information including definitions for these indicators. Access the chart set and information about the online database OECD Health Statistics. The OECD has also undertaken a cross-national analysis of the quality of cancer care performance and published the report below. The analytical work involved the OECD network of national cancer experts and collaboration with key organisations and projects with international expertise in this area, including the CONCORD study which undertakes a study involving an international comparison of survival estimates and the EUROCARE study which follows the survival of cancer patients in Europe. Also read "How should the EU act differently in tackling the burden of breast cancer? ", article by Francesca Colombo and Rie Fujisawa, Government Gazette, July 2017 issue.